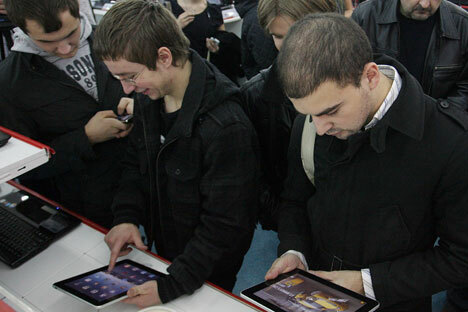 Some 40,000 iPads have been sold in Russia, compared to around 15 million worldwide, said Sergei Kuzmin, the deputy editor of Mobile Review magazine. But the actual number is difficult to estimate as the majority are imported by friends and family abroad at a 50 per cent discount. A 16 gigabyte model with Wi-Fi retails at $499 in the US compared to an average of $700 in Moscow stores. Significantly fewer tablets are exported to Russia than to Europe, and people are willing to wait for cheaper models, as the current shortage of supply helps drive prices up, says Oleg Karnovich, a salesman at authorised Apple dealer Re-Store. Despite sales falling behind international levels, the iPad remains the most popular tablet. Experts say that other brands are catching up because the current model’s screen is too bright and the lack of a video camera is a serious shortcoming. “LG has come out with a more or less competitive tablet, but the market is still very hungry for iPads,” said Karnovich. But he added that the iPad has several advantages, including its multi-touch technology for its screen, and is planning to add a camera to its upcoming model. Statistics shows that iPads are read mostly in the evening. Mario Garcia, the CEO of Garcia Media, which specialises in newspaper design, said that people use smart-phones to check the news during the day, while iPads are for features to be read later, somewhere more comfortable and relaxing. “You could never do this with the online news media, and that is why tablets are very good platforms for features and books,” he said. But the most popular applications are games and social networks increasing the popularity of tablets among kids and young adults. “For example, if you install a popular game like Angry Birds, you are guaranteed that the tablet will turn into a favourite toy for your kids, who will grab it right away,” said Kuzmin. While handheld PCs offer pictures, cartoons and interactive books for kids, the most popular applications among adults are office tools and communications apps, such as Skype. “Leading Russian developers have embraced the iPad”, said Alexei Petrovskikh, the head of the mobile apps unit of Gals Soft. The software sector has seen rapid market growth despite the lack of domestic sales, and Russian companies believe the iPad can give them access to the international market. “Now we are close to catching up with the biggest foreign companies, which have been exploring the market for a long time,” said Petrovskikh. He added that some of the top apps create a nostalgic feeling and mimics real life, such as a game that simulates falling sand in a playground. Developers get paid a cut each time one of their applications is downloaded from Apple. “Paid game applications is a niche where Russian programmers can have considerable input,” said Petrovskikh. Russia’s big three mobile operators – Beeline, MTS and Megafon – have special tariffs for 3G from around 300 roubles to 400 roubles ($10-13) per month for unlimited access. Around 12,000 places in Moscow have Wi-Fi, according to Beeline data. The development of 3G internet has sparked demand for online media, with outlets racing to catch up with consumers. “Visual tablets have more in common with traditional journalism, and the best US and European newspapers are already there,” said Garcia. He predicted Russian newspapers would adopt a model when issues on working days would come out on the iPad, while a thicker issue would go to print on weekends. SPB, meanwhile, offers live TV, with 150 channels from over 20 countries as well as on-demand services, while Megafon has also launched a TV portal based on the developer’s software. Sales of tablets have also highlighted the gap in wealth and Internet access between the capital and the rest of the country, according to Kuzmin. “It’s obvious that the vast majority of iPad owners are concentrated in Moscow,” said Kuzmin, who had his iPad sent from New York. According to Gartner analytical company, app stores will generate total revenue of approximately $15.2 billion in 2011. Customers will spend a large chunk of this money at the AppStore, created for IPhone and IPad owners. The AppStore also offers some rather interesting applications from Russian programmers. We have chosen the most useful and popular ones. This Russian-designed programme managed to rank first in number of downloads in the games category. The game is very simple: you have to feed candy hanging on ropes to a creature that looks like a frog. By cutting the rope in random places, the candy drops from the swinging ropes based on the laws of physics. The game is made more complicated in that you have to collect all of the stars on the screen while also catching the candy. With this app, you can turn your device into a full-fledged musical instrument. The programme’s interface is extremely simple and clear. Anyone can learn how to play basic melodies. Among all the entertainment programmes, you can also find a few serious applications. The MediPad app is a perfect example of this. The programme makes work easier for doctors by enabling them to search for a patient’s medical history, test results and x-rays. MediPad also automates the diagnosis and treatment process. The programme is to be put into commercial use this year. We frequently use proverbs and sayings. One phrase is sometimes sufficient to replace a five-minute monologue. But what do you do when you cannot find that phrase? IPhone users will be rescued by the Ask a Book application, a virtual library containing more than 5,000 phrases in Russian and 6,000 phrases in English.